1 Two of the three little pigs had trouble finding the right material for their houses. Straw didn't work for the first little pig. Sticks didn't work for the second. So both little pigs got eaten up. The third little pig chose to build his house out of bricks, and that kept him safe. Picking the right medium for an art project is as important as building a house out of the right material. 2 In the artistic world, a medium is what is used to create art. Artists can pick from many different media. Each artist has his or her favorite medium. 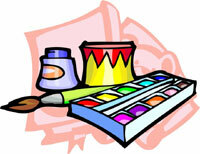 Your art cabinet may have watercolors, oil paints, crayons, and pencils in it. You can try to pick the one that will be the best for your project. But the big bad wolf won't bother you even if your project doesn't work out. 3 If you want a speedy medium, pick watercolors. Watercolors are like the Speedy Gonzalez of paint. They are made from colored powder and water. Watercolors dry fast. The artist has to work quickly. Usually, the artist uses a soft hair brush on a rough-textured, white paper. The hard thing with this kind of paint is that it dries so fast you have to know just what you want to paint...right away. 4 Watercolors have been around for a long time. Ancient Egyptians used watercolors on papyrus. Ancient Chinese artists used watercolors on handmade rice paper. Indian artists painted the many Hindu gods and goddesses in bright watercolors. One god, named Krishna, was always painted with bright blue. Feedback on What Is a Medium?